Medicals, hospitals, clinics are our part of life. People are going to hospitals & clinics for regular checkups or other medical services. Medical themes are an interesting area, because you can’t simply look for the most creative design. Your business depends entirely on your image, so showcasing testimonials, displaying your facilities and presenting any awards plays a huge role in your success. It’s gonna be difficult to earn people’s trust without a good looking outlook. 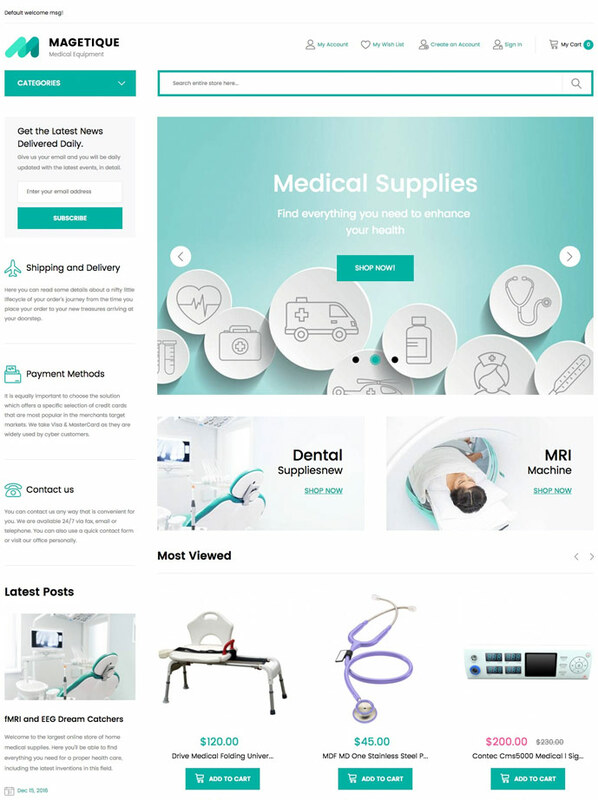 Soar your way to success as you now create clean and professional looking medical websites using the Magento medical Themes. 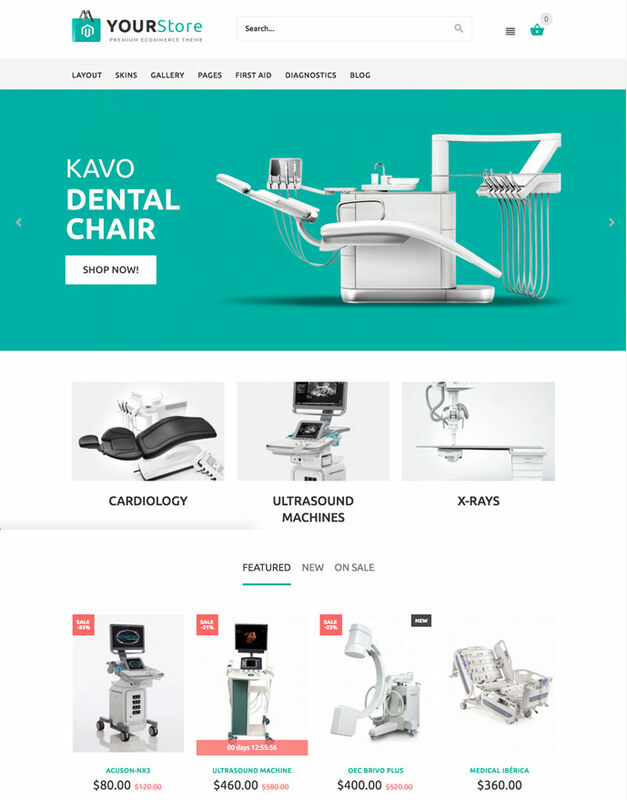 Choose from our list of more than 10 Professional Magento themes for Medical and Healthcare stores and pick the one you like the most. As far as versatility is concerned, Magento templates are like no others from varying content management systems. They are suitable for users of all levels, and most templates are developed to grow with the user’s knowledge and expertise. They are all easy to use, relatively cheap comparing to hiring a pro to do your job. 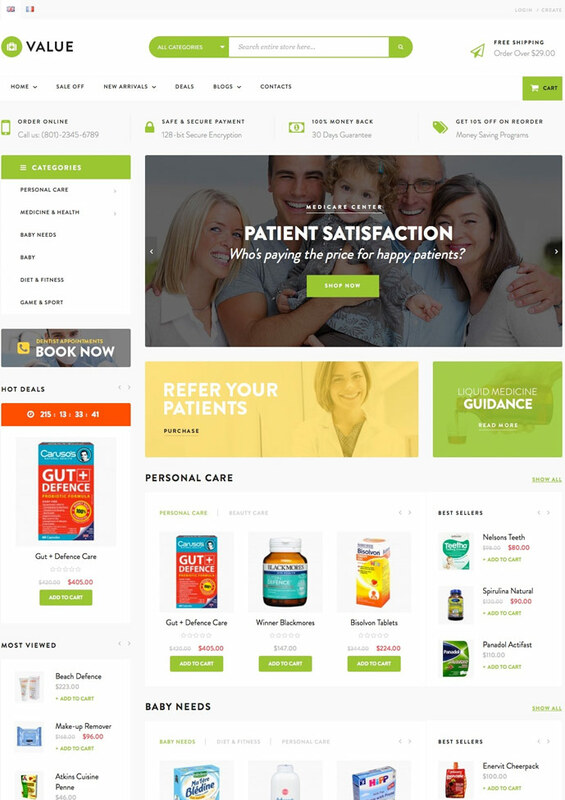 The Magetique is the most popular Magento theme that can help you create an impressive eCommerce website, Magetique theme is great for Medical and Healthcare Stores. It embraces all of our design and technical knowledge, which translates into the most advanced Magento 2 experience. Magetique is very much a theme for modern times, deploying a series of incredibly cutting edge tools that make the website design and creation process a highly approachable task that will take you mere minutes to complete. With a myriad of marketing, design and administration tools will amaze and engage your visitors, while requiring absolutely no previous coding skills or experience from you. No other theme on the market offers this much functionality right off the bat – you’re getting over 20 extensions that facilitate your business needs. From simple upsell modules, like Smart Product Labels and Featured Products, to advanced design functions, like Parallax & Background Video. Easily edit pages, page blocks and various on-screen elements to provide a tailored shopping experience for your clients. A carefully weighed analysis of the structural components of a successful online shop website, interpreted through the lens of advanced HTML5, CSS3, AJAX and Parallax technologies in a Bootstrap framework, has culminated in Magetique, the ultimate theme for online shop websites. The package includes 5 layouts that were carefully crafted to fit a variety of niches. They are easily installed and managed with an intuitive interface and detailed documentation. Magetique theme is also fashioned to display your website beautifully on any types of mobile devices from desktop computers to modern mobile phones. It is carefully designed to provide an outstanding shopping experience to your customers. Lastly, this theme is fully optimized for SEO with the latest web technologies and high GTMetrix and Google’s Page Speed scores to help your website rank well on major search engines on the web. Try Magetique today! Yet another multipurpose Magento theme makes it way into our list. Being designed to fit with many different kind of stores, not by no means it’s inferior to the ones that are specially designed for electronics stores. YourStore Magento theme amazes everyone with its good looking through a smart combination of colors and layout. Just like the one presented above, all of its sub pages are customized. A clean and professional look are not the only thing you can find, but also many advanced other features, namely Optimized for Fast Loading + CSS Sprite, Smart Responsive Product Grid, Flex Slider Integration, Configurable Swatches Option and so much more. 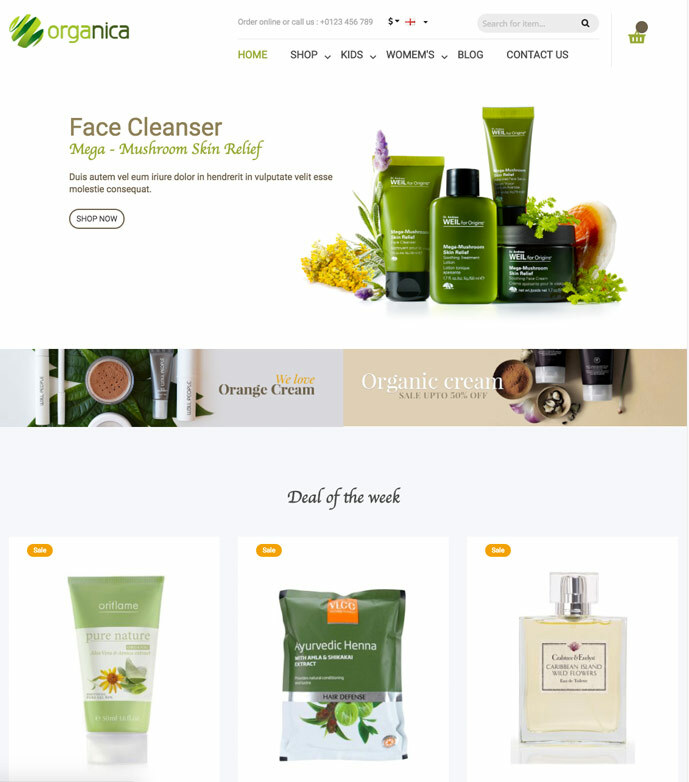 Organica is a modern and engaging, wonderfully intuitive and very well hierarchized, business minded and very robust, structurally navigable and readily responsive multipurpose Magento website theme. Organica has been crafted with plentiful attention to detail and remarkable versatility in order to effortlessly perform at very high level under the most demanding conditions regardless of scale and size. Organica theme is packed with many different features. It is like a starter kit for ambitious online merchants. Atelier benefits from amazing loading speeds, due to the organized and clean HTML 5 code. In order for your site to remain relevant, it must be optimized for search engines. Gorgeous masonry layouts for dynamic product exhibitions, themed categories with unique layouts to showcase your products as you desire, and limitless color, sidebar, header, footer and shopping cart configuration options through the advanced theme options panel round off this solid, innovative commercial theme. Clear Vision theme captivates with a clean, well-structured design. The page is imbued with an effect of radiance having light photos shining on the white background. A slider does its best job, promoting your New products and special items so your home page will keep the visitors’ attention busy for a while. The main menu of this theme features a drop-down option to keep everything from being cluttered. A newsletter subscription form will pop up as soon as your guests make their entrance to your website to motivate them to join your readership. Moreover, you will also be able to build a devoted community around your store with the help of an integrated-Blog. The introduction of the branded items helps in gaining your customers’ trust in your store. Ves Valuestore finishes our list with its appearance that is much suited to the store of many different businesses. It’s originally created as a multipurpose theme and electronics stores are among the ones that was considered a target. You are able to create as well as customize your own layouts which are based on the premade demos with the help of the Lightweight Drag and Drop Page Builder. All necessary kits are presented in this amazing theme so you don’t have to bother looking for anything else as extensions. With the best tools prepared for you like Ajax Search & Autocomplete, live CSS editor, ajax layered navigation with price slider/filter, brand logo carousel, powerful blog platform, layer slider, drag & drop mega menu builder, Ves testimonials, you’re already good to go to have your most prominent as possible. Just imagine the time and efforts would be wasted without this theme, you will realize its greatness. Drugs are among the online bestsellers, sell them on the web and raise your conversion. 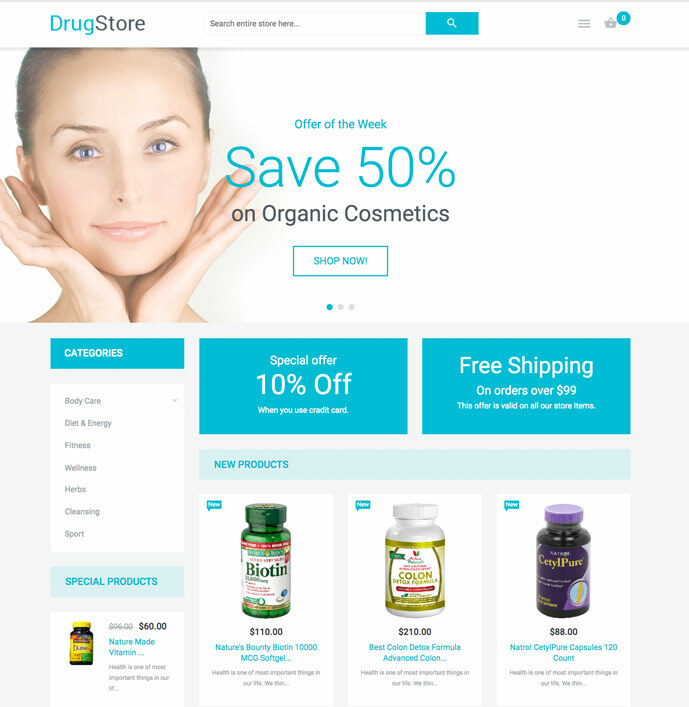 Drugstore Magento theme helps you settle your place in the rank of the elites in this business. It looks stunning with a clean and bright layout. The built-in slider effortlessly promoting the healthy and gorgeous item images as well as the special offers that you’re willing to give out. The main menu presence is not to be seen. In an attempt to enhance the theme’s usability, sidebar categories were included. The theme divided the featured products stand into three column formation. Your offerings are also enhanced as the ‘Quick view’ option, three call-to-action buttons and star rating are introduced. The “New” tag also helps with diverting your visitor’s eyes to your newest stock. 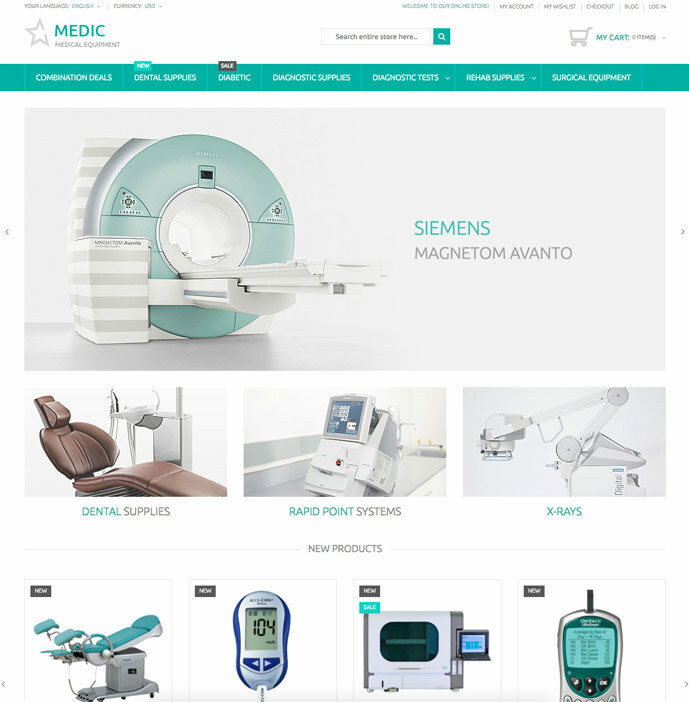 One of the best e-commerce mean in selling medical stuffs and equipments has been presented to you in the form of Medical Stuff Store Magento theme. Thanks to the advanced search form at the top of the page, Your guest will be able to get access to their matching item in no time thanks to the advanced search form at the top of the page. Light green and white are known as the most used and suitable colors in the sphere of medicine, so The palette proves to be very relevant to the store’s theme as the combination of light green and white are famous for their collaboration with the pharmacy stores. An intuitive side navigation is further improved by a huge range of categories. The featured products as well as their reviews are presented in the slider while being enhanced with Quick View Option. 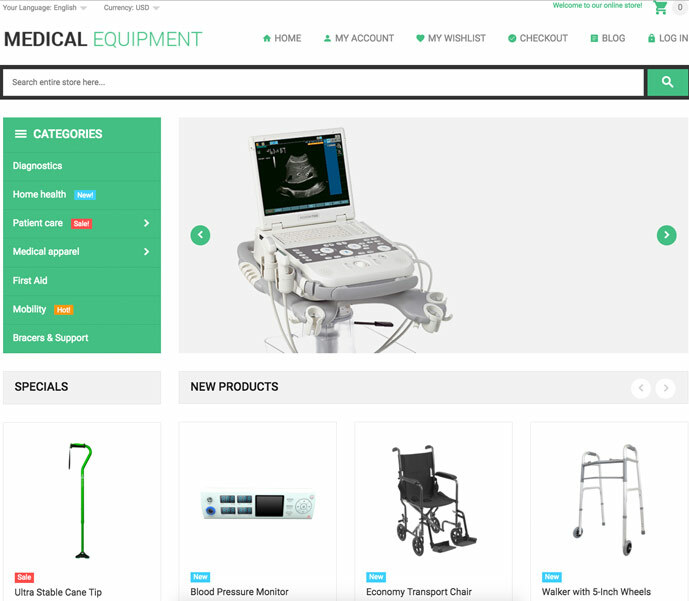 Medical Equipment Magento Theme is another theme that was designed for the sake of medical equipment stores. It’s perfectly suitable for the medicine, sterility, therapy, and recovery establishments with a white and light green background . Your modern equipments will have the best seat on the front being featured in the big slider, hogging all the spotlight as well as attention. New products, tagged with Quick View option, are also have their place in sliders. The informative stickers, star rating, item descriptions, and three call-to-action buttons are also there to make your life better. The visitors won’t be bored since there are so much prepared for them aside of the items, such as the useful informations that appear in ‘From the blog’ and ‘Events’ sections. Footer contains social sharing block and subsidiary menu. 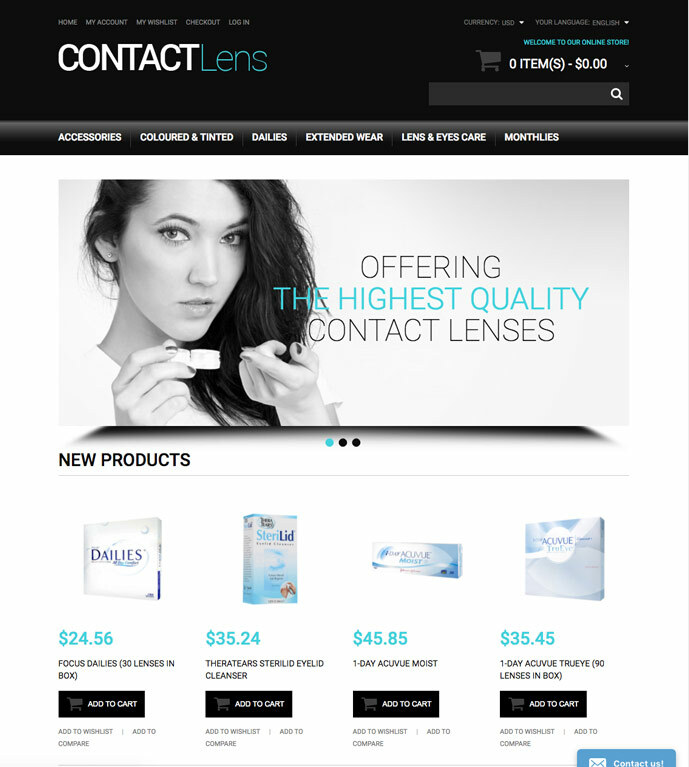 This theme is here to prepare the best things for you to stand out among the others in contact lenses selling business. 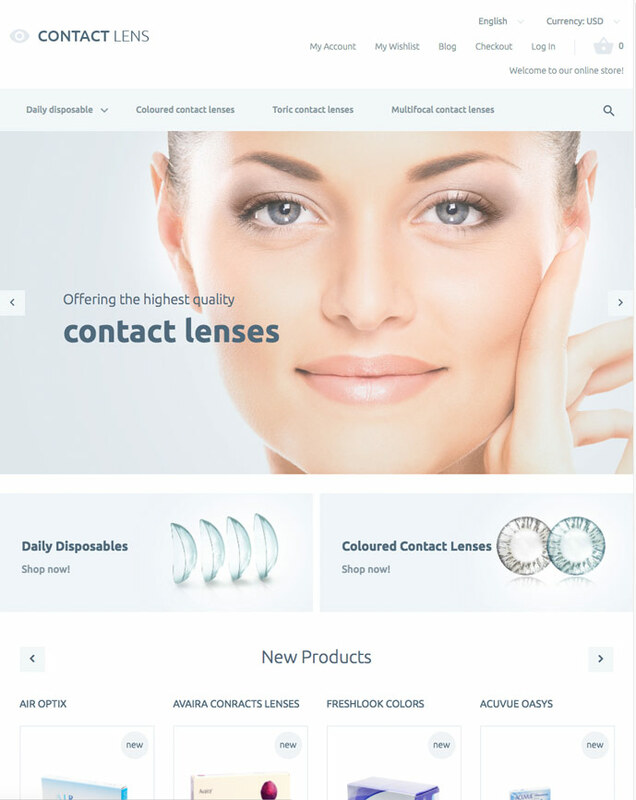 With the help of Vision Contact Lenses, your store will surely flourish. With the image of a lady with charming eyes, this theme makes its intention clear to the customers. They will look just as good as the image presented with your great products. A turquoise and white color scheme symbolizing clarity of a look will play it role in inspiring your visitors to try out your items. With this amazing Magento theme, you will without a doubt have the best preparation in building a great eCommerce site with a lot of revenue coming. 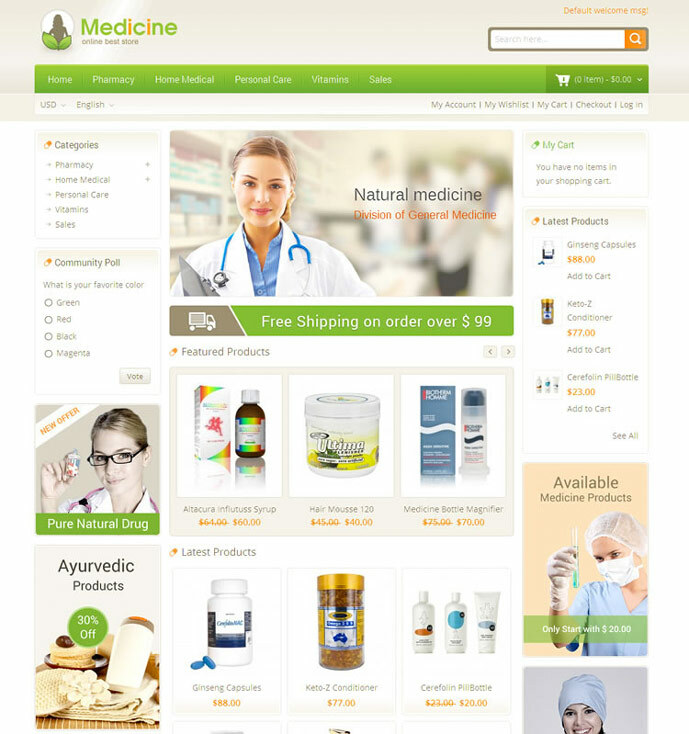 Medicine Magento theme is an amazing Magento theme for medical stores and drug stores with a very nice and professional design. With a clever combination of colors, it looks stunning while remaining true to its purpose. All sub pages are customized. The notable features are Manufactured/Brand Logo + Slider – Admin Options, Advanced Mega Menu Integration – Admin Options, Cloud Zoom Integration – Admin Options, Featured Products Module, Bestseller Products Module and Latest Products Module. There’s no risk in adopting this great one, only high reward. 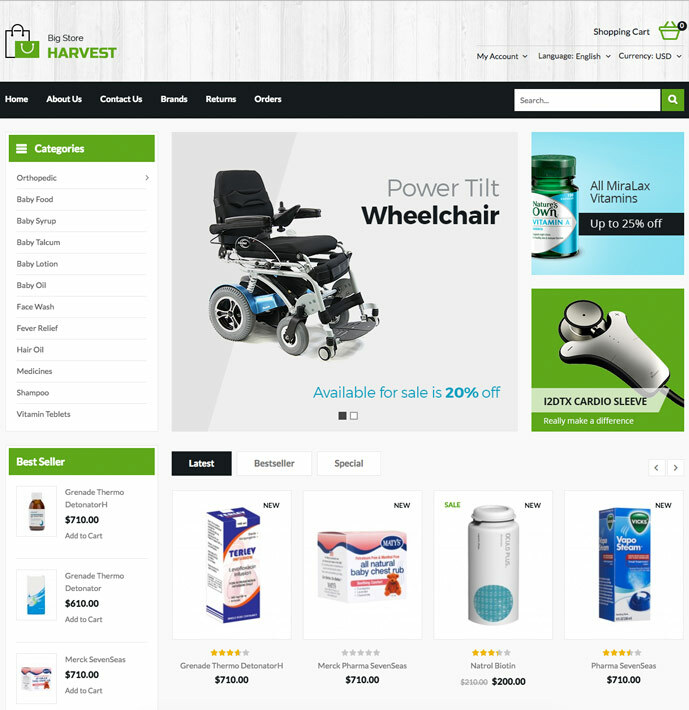 Harvest is quite famous for its flexibility, the power to suits any kind of eCommerce store while greatly enhance that one’s performance and appearance. It boasts a great look with a clean and professional design comes with ten choices of premade demos and color collections. With its awesome arsenal of advanced tools, it will make sure that your store have the best things coming in to it. Advanced Mega Menu Integration, Cloud Zoom Integration, SEO friendly, Smart Responsive Product Grid are among the great things mentioned, to name a few. I hope you enjoy this one as much as we do. 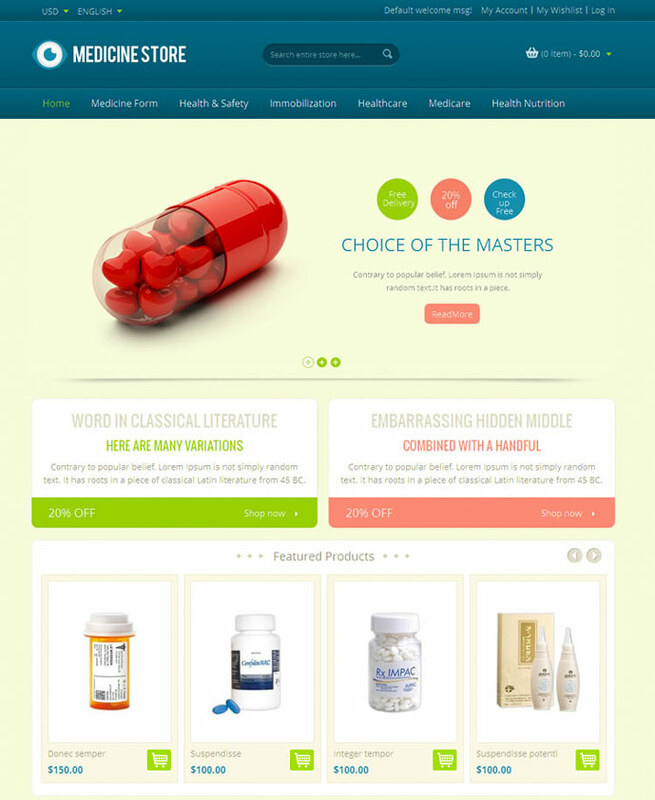 Medicine Pharmacy Magento should very well be your first choice when it comes to online pharmacy store options. It’s the perfect match for you to showcase your best items, in this case, your various stock of medicine. Anything your store needs, it will provide, and sometimes exceeds your expectations. It’s fully capable to do it, with the latest technologies the market has to offer. Built HTML5 and CSS3, enhanced by Google Fonts, Easy Shopping Cart Dropdown, Advanced Mega Menu Integration…your store will run smooth and look nice in this great template. So rest your hesitation for some other times, and try it out.